So this is another character background for a game I will be starting soon. It should be similar to The Nightsong which I did some months ago. The game will be run in a the World of Darkness setting, put out by White Wolf Publishing. The Game Master, has designed her own world where the kindred (vampires) won in the apocalypses and shape shifters (werewolves, cats, rats, etc.) are fighting back in a resistance, with the help of some others. Mage’s have an alliance with vampires for the most part, and hold a special status in the kindred’s society. All other humans are subjugated, work for the vampires, and are herds to their blood needs. I just wrote this today and have yet to revise it, though I generally do not revise much. Hope you enjoy. The story I tell you today is one that I have lived, it is filled with truths and fiction; but understand that those lies I tell are only made up to protect me from the absence of truths. I am Kaedrim, or Kae as my master affectionately calls me. My master did once give me a surname, but I use it so little that it has no purpose in this story. In fact Kaedrim is only a mask I wear for the world that I was brought into. Those that truly know my heart and my passion call me Eve. That is the name I wish others to fear one day, the name I have chosen or perhaps was given to me by Atum, the Great Serpent; who my soul is linked too forever. I was born in the year 1750, to two of the overseers in a prominent Setite household. But like all children raised in that house, I did not know my parents. The information was thought to add an element of emotional attachment to us humans, and such things can cause dissention. Though I have no doubt that the type of humans that can become overseers would had murdered me for a single mishap. So perhaps it was a good thing, because I have made so many mistakes over the years. That home was all I knew for much of my youth. As a servant to the house, I was required to do anything that was asked of me. You will have to wrap your tiny little minds around that concept; my bloods was theirs for the taking, my body was theirs for the taking, and above all my service was to the house. That was a better life then most humans had, and for such high service I was allowed luxuries that many others are not given. So it was that in my late teens, I began to rebel against my bonds. Though rebel might be too liberal a word for it. For I had no real power to rebel, maybe I should say that I tried to numb the bonds that held me. I found a way to numb my pain at the cities many night clubs and concerts, you know the places were the sheep go to forget the wolves that herd them. Alcohol became my friend, and then drugs when the alcohol was not enough. But with any great way to numb ones pain, came a weakness of mind, senses, and precision. Above all the house that I lived in those years, expected precision from its servants. When I began to spiral down the rabbit hole, after taking so many of the red piles, I was punished. The overseers believed they could correct the problem in me and they were as creative as their blood sucking lords. But as those trips into Wonderland continued, even with the punishments I continued to grow more and more reckless. I am sure you can see where this would lead? In 1770 when I was nineteen I was given as feed to the snakes. You see not all Setite follow the old traditions or see themselves as akin to serpents. But many still do and keep snakes around as pets or as guards. Those same vampires also enjoy using snakes as punishments. Because of this the city is filled with them, and I often find it amazing that the many rats can survive. The house had a large ceremonial chamber within its recesses, with a rather large pit filled with snakes of different varieties. While the chamber was used very little by the lords of the house, the overseers still had to feed those snakes. I will not bore you with the details of the last deeds committed before I became snake food, but you could say it was one of the wildest nights I had ever had and today I look upon it with utter disgust. So to cut this short, I was thrown into that pit and they left me there, perhaps it was even my true parents that did it for it was a male and a female about the age they should had been. They spoke no words, showed no pity, it was like taking out the trash after all. And today I find no fault with that categorization. Can you guess what happened? She was bitten or strangled to death, then eaten right? Though those of you with some logic would first say, none of that could had happened, since you are speaking to us. And you would be correct, do you feel special now? Now that you are all smug, let me say that you are also wrong. I was bitten several dozen times, and snaked curled around me that felt like vices. I felt my insides burning, pressure building, my senses distorting, and my mind slowly leaving me. Have you ever had your ears pop? Well perhaps not, since most of you have never left the NYC, or climbed a mountain, or even been to the top of a skyscraper. When you climb in elevation, there is a point, maybe even a few points that the pressure will build in your head and your ears will pop releasing that pressure. That is what happened to me, not just to my ears, but to my entire body. For lack of a better explanation, I popped. My senses, mind, ears, eyes, insides, even my very skin felt that sensation. 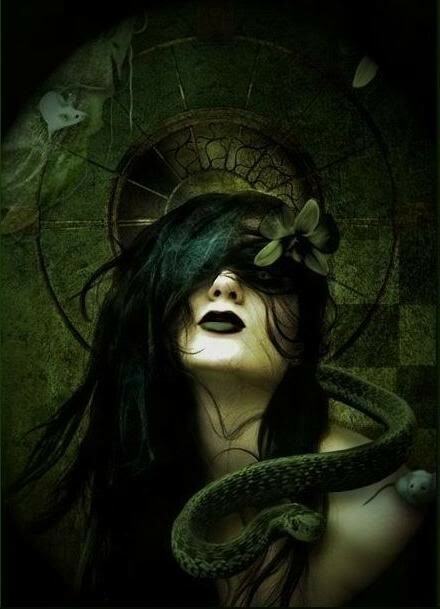 I felt the venom that had been burning through my body suffuse with it, I heard the snakes whispering their apologies in fear, the coils release and the bodies made way for me. And above it all I felt a presence as old as the world, if not older, one that made me sick up in fear, and one that made me feel as if I was ant ready to be stepped on. That feeling has never left me, he is a part of me and has always been it seems. Those snakes helped me out of the pit and lead me away into the sewers. I was a wreck still and running from what seemed to me at the time as someone just beyond my sight, right behind me and all around me. I could not place a word to that type of fear. Those sewers had more than enough fear for me, and in that weakened state the world turned around me. I was in pitch black, but still I could feel a change to the world I had known. Even through that creature hunting me, things smelled, tasted, and felt different. I felt alive for the first time in a high that I could not explain or reason. Do you believe that one can be alive and afraid at the same time? If you do not, I pity you again. I will spare you the details, but let us say that my present master soon found me. I had freshly awakened, and the release of power that had happened upon that transition was enough for my presence to be felt by someone close. I am told that this is unique and my circumstances have dropped many questions at the point when I arrived to this new life. That power shaped me in his own image, it was my avatar Atum, the creator God remembered in Egyptian culture. He rose as a snake from the primordial waters to create the Gods and the universe. He who will rise again with the destruction of the world, or perhaps that was to destroy the world? My master has told me that he is also been called many other things, in many other places. To the Germanic people or years ago, though you might better remember them as the Vikings, he was called Jormungandr, the World Serpent. He again in this history predicted the end of all things, and was big enough to encircle many worlds. Then to the Hindu culture of ancient India he was called Shesha, a primordial being of creation, and avatar of the supreme creator. It was said that Shesha could hold all of the planets of the universe within his coils. That he had the power to both destroy and create with even the slightest movement of that snake’s body. Oh well my master taught me others, I think some dragon in China, and serpents all over European and Asian cultures, even a serpent at the beginning of those Adam and Eve histories, but I lost interest and was actually thinking about other things for the rest of the teaching. So to put it simple, I am a freak! Serpent eyes, teeth, tongue, and yes my skin too is scaled, thought you might not notice unless you are close to me. I have been given other gifts, some of which you can see in what I have told you, and others you do not need to know. None of my appearance is similar to what I was before, and perhaps that is a blessing as well. My features have changed, and my hair is now black, not the red that it was before. Life does run us in parallels does it not? I once served Setites that saw red hair has a prominent marking in a person. While I have no red hair, I have snake features that many Setites look favorably upon me for; and might I say some vampire like features as well. I once served Setites that worshiped the ancient Egyptian religion that saw themselves decedent from Set himself. I now serve as master who has taught me magic in many of the ancient Egyptian ways, and I am now linked with the God that created the Egyptian Gods like Set. I was given to snakes, and was born into one. With all that, you could ask me now why do I work with you rebels? Why do I risk it all to help you all achieve a better world? Even when mine is as good as any human can imagine. Perhaps I cannot let go of the past, or maybe Atum drives me to rebel against the corruption of this world? Well, since you are dying, and even without that the words I say would slip your mind within seconds of me saying them; I will tell you the truth my friends. (excited whisper) I do it for the chaos, I feel some primal urge from Atum to destroy, I really do not know if my purpose is to help the kindred fall, to save the world and the people in it, or if it is to break the world in the end! (smiles and pushes the hair away from the dead mans face) Do not regret your deaths tonight, they did serve a good purpose in the end. I am sure our compatriots will look favorably on me for this victory. When Anubis brings you before Osiris in the underworld, remember to tell him I sent my blessing along with you, remember to tell them that you were sent by Eve, the deceiver, the incarnation of Atum their creator. I am sure they will treat you kindly. This entry was posted in On Writing and tagged fantasy fiction, fiction, mage, vampire, White Wolf Publishing, world of darkness.